I offer private yoga sessions and group classes to suit your needs. … amongst other things. Get in touch today and let me know what you’d like some help with. I hope that these One to One or Group Yoga sessions can be just the thing to get you back to feeling good. Call Rosanna on 07875 355 925 to book a one-to-one session or for group class info. 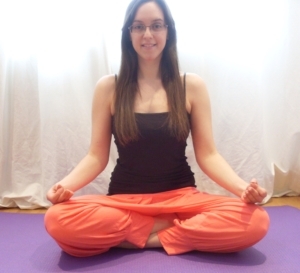 I’m Rosanna… Yoga Teacher, Writer, salad cruncher, cake lover & real yogi. I will be teaching feel good yoga classes at Rodney Street Therapies from July 2016. 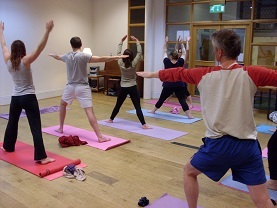 Classes are a hatha/hatha flow style, open to all abilities. We can all feel down, tired, stressed, sluggish, lacking in energy or out of sorts from time to time, and I see yoga as a great way to naturally and effectively boost your mood and increase your overall sense of wellbeing. I use yoga, combined with a positive approach to help people to feel better in mind, body and spirit. WOW! I cannot recommend Rosanna Gordon enough, she created a relaxing, supportive and peaceful environment to enable me to have an energising and rich yoga session. Her positive approach and encouraging words throughout the session enabled me to push myself to get more out of the movements, whilst always feeling relaxed. Rosanna made me feel very at ease and that she was ‘with me’ all the way! I have now decided I simply must start a yoga class and that is all thanks to Rosanna. I am a qualified Yoga Teacher, having trained with the British Wheel of Yoga (BWY) in London 2010-2012. I completed the BWY Foundation Course in Berkshire 2009-2010. In 2009′s The Yoga Show, London Olympia, I took part in the Yoga Aid Challenge, completing 108 Sun Salutations in two hours, with all donations going towards The Special Yoga Centre charity in North London. It was hard work but a lot of fun!